When testosterone preparations, along with their prescribed dosages and frequency of administration are customized into a specific regimen for individual treatment, it is collectively known as hormone replacement therapy (HRT), or as testosterone replacement therapy (TRT). Hormone replacement therapy is a more general term that refers to the systematic use of any (including testosterone) exogenous hormone administered for the treatment and restoration of normal levels. For example, Synthroid (levothyroxine sodium) is a prescription medication used in thyroid [hormone] replacement therapy, for the treatment of hypothyroidism and the management of hypothyroid symptoms. 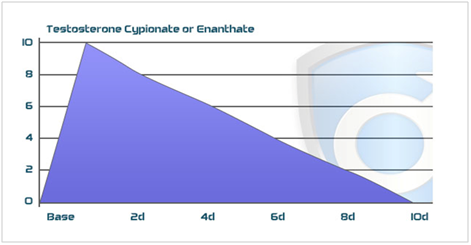 Synthroid is a synthetic hormone identical to thyroxine - the naturally secreted thyroid gland hormone, thus its replacement is considered hormone replacement therapy. More specifically, testosterone replacement therapy is a highly effective treatment regimen for the restoration of testosterone deficiencies including andropause, and all other causes of low testosterone production. So TRT differs from HRT in that the former uses testosterone preparations to treat its deficiency, whereas the latter can be any type of hormone replacement therapy. TRT uses a variety of testosterone preparations, or differing methods for delivering testosterone treatment dosages. Although these preparations vary in numerous ways, each of the following provides adequate levels of testosterone replacement along with inherent pros and cons. The key is to find the one that best suits you and your style of living. Oral tablets will always be popular because of their unique vitamin-like convenience, and ease of use. Many men prefer this form, not only because they're already accustomed to taking vitamins, but also due to their disenchantment with needles. However, tablets are harsher on the liver than other preparations, and are generally taken daily or twice daily to guarantee the proper blood serum levels are maintained throughout the day and night. Tablets can also be too easy to forget for those men who are unaccustomed to a daily vitamin regimen. Some Patients also experience a roller coaster effect as there levels can yaw up and down with this treatment method and only get a mild bump total elevation of testosterone levels. For such men, this is obviously not a good choice. Other injectable preparations include combination fast, moderate, and slow release hybrid blends most notably the incredibly popular Sustanon 250, and its lesser known relative Omnadren 250. These products and other similar ones are best taken frequently at first, to gain immediate benefit from the short esters, and then less frequently later after the long/slow esters have accumulated within the bloodstream. Another viable option is the testosterone patch. The patch comes in a variety of dosages and brands, among which Androderm is the most popular. The patch is reportedly uncomfortable for some people, but most don't even realize it's there after a while. Some patients only get a mild bump in there peak levels or none at all after a certain period of use. It requires routine daily changing, which like taking orals, can be problem for some yet it's still an often used delivery mechanism. The older versions of the testosterone patch required attachment to the scrotum, but today's patches should be applied to a clean, dry area on the stomach, back, upper arms, or thighs. It's important to rotate attachment sites daily, allowing at least seven days before reusing a site. Some people experience allergic reactions to the adhesive in the patch, which can manifest in a variety of skin irritations. Testosterone gel is a preparation that comes in various dosing solutions, and kind of melds together the characteristics of several applications. That is to say, it requires more frequent administration similar to tablets, is absorbed transdermally (through the skin) like the patch, and elevates serum levels quickly like both the aforementioned delivery systems and intramuscular testosterone propionate. Testosterone gel has, since its debut, been a very popular preparation mostly because of its great convenience and quick personal application. However again some patients only get a mild bump in there levels or none at all after awhile with use and require a more effective delivery method like injections. Testopel is a subcutaneous crystalline testosterone pellet manufactured by Organon, and approved in the U.S. for the treatment of men with testosterone deficiency syndrome. This long-acting pellet is inserted subcutaneously (between skin layers), and can provide a sustained testosterone release for 3-6 months. For obvious reasons, such a method is not as popular as some of the other preparations mentioned above, but these pellets are still just as effective. Patients are required to undergo a surgical procedure to implant the pellets and the sensation of the pellets to some are annoying and bothersome. Due to lack of large-scale, long-term studies assessing the benefits and risks of testosterone-replacement therapy in men, controversy remains regarding testosterone supplementation. Reports indicate that TRT may produce a wide range of benefits that include improvement in muscle mass, body composition, libido and sexual function, bone density, quality of life, cardiovascular disease, mood, erythropoiesis, and cognition. However, the most controversial area is the issue of risk, especially regarding the possible stimulation of prostate cancer by testosterone. Even though there is little hard and fast evidence to support this particular risk, it still exists. Other possible risks include worsening symptoms of liver toxicity, benign prostatic hypertrophy, erythrocytosis, hyperviscosity, and worsening untreated sleep apnea. Despite this controversy, testosterone supplementation in the United States has increased significantly over the past several years. If you feel TRT may be appropriate for you, by all means make an appointment with your physician to have your testosterone level tested. Ranges vary by laboratory, and each uses individual formulas for computing values, which means there is no absolute range of normalcy. Your physician will review the results with you to aid your understanding, and to help you interpret your very specific profile independent of the laboratory's generic one. The physician should also discuss the potential benefits and the very real risks of TRT. 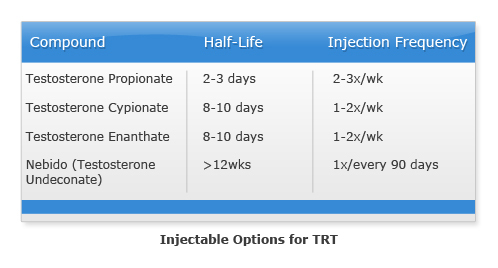 If it is determined that TRT is needed, your physician will outline the available options (most of which are listed above) in greater detail and help you select the best testosterone preparation for your preferences and lifestyle.